Elliot Woodward AS Media Course Work: Evaluation Question 6: What have you learn't about technologies from the process of constructing this product? Evaluation Question 6: What have you learn't about technologies from the process of constructing this product? 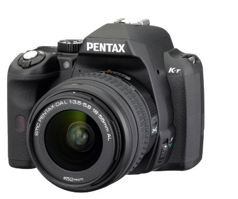 For my photography I used the Pentax K-r 18-55, which successfully captured all of my images used throughout my magazine. 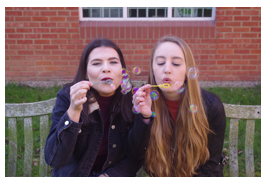 Its high quality imagery and focus was perfect for my magazine as it added a touch of professionalism and allowed me to capture more than I wanted, for example the photo on the contents of the two females in the duo band ‘formality spectrum’ are blowing bubbles, and I was able to enhance to colour inside them creating a purple luminosity which looked very indie and bright. This was one of many skills which I learn’t and developed through out the photography process. 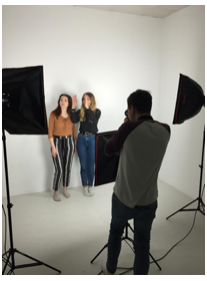 Selecting an appropriate shutter setting was another key feature I took advantage of, allowing me to take double speed photographs which gave me more range to select from during the process of creating the magazine, including captured natural shots of my models. I also learnt how to choose an appropriate setting for my camera in terms of angle and portrait/landscape, which highlighted natural complexion of my models and made the photo seem more eye catching and powerful to the audience. For some of my photos I used artificial lighting, unlike the natural lighting I captured outside for others I took. This involved two lighting equipment stands which I learn’t worked together to capture the whole of the model’s body clearly without shadow or dark patches. 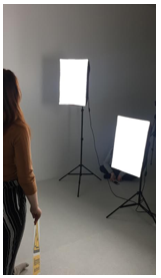 I used a white backdrop for my artificial lighting giving me much easier editing ability when it came to cutting and cropping, allowing a smoother look on the edges of my images. I used this advanced editing programme at school and at home to create and produce my media product - a music magazine. I have learnt how to cut, enhance and crop elements of images with in-depth precise smooth corners to create a professional finish. For example the magic tool, which can cut out an image from it’s background, however busy it is. The magic eraser was another tool which you can adjust in size to fit your preference, allowing mistakes to make corrected easily and efficiently. The most useful tools would be the magic tool, as it gave me the power to create anything from combining individual layers on top of each other in a way that looked professional. The advanced letter options, like spacing and depth/shadow of the font reinforced the smart look and enabled me to find the perfect design which would appeal to my genre. 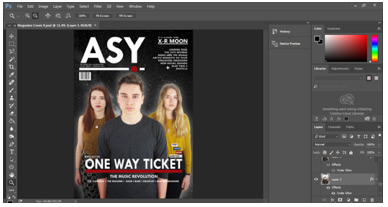 have also developed my understanding of how to layout my magazine, understanding the individual layers on photoshop and where best to place them. I have also learnt the skill of spot removing on my models skin to leave a clean finish, making them looking even more professional in terms of make-up cover up before photos were taken. I also learnt how to create a starry night photo for my cover background from scratch using photoshop features like noise and contrast, which before I could never of accomplished. During the research stage of my media product I used a variety of online sites which helped me to find similar magazines within my genre and access exclusive information hard to find a copy of. This included Google and Youtube which worked well when I wanted to find inspiration. UK Tribes was a very useful website which I used to identify my targeted social group and audience, as it provided a summary of their preferences etc. I also used online sites during the designing on my magazine, such as Scribd to convert my document into a preview which enabled me access its embedded code which I could use to present my work on a site called Blogger which my teachers and peer colleagues would check and comment on my work leaving improvements etc. Animo was another online site which allowed me to produce a short movie clip for my 25 word pitch video, using photos to explain and develop my ideas.